Workshop attendees getting to know each other. On 24th October staff and students were invited to a joint workshop between BGS, the Lyell Centre and the Heriot Watt University School of Mathematical and Computer Sciences (MACS). The aim of the workshop was for BGS and Lyell Centre informatics staff and developers to meet each other, and MACS students and staff, with a view to thinking about areas where we can work in collaboration. The day was broken down in to two parts during which the 25 attendees could present flash talks on their area of expertise and ongoing work. The morning was dedicated to Maths, Modelling and Statistics and the afternoon focused on Computer Science and Informatics. Each of the flash talks was designed to prompt and spark ideas for potential future collaborations between our staff and organisations. The BGS team presented talks on geomagnetic field modelling and the ongoing role and work of the Informatics department including data delivery, data science, geosemantics, European and International collaborations, commercial and overseas development work. It was fascinating to hear about the work of our neighbouring colleagues. Having the opportunity to hear about (for example) differential equations, robotic bar tenders, mathematical modelling for disease in plants, humans and animals, identifying tourist landmarks using spatial and semantic clustering and the integration of heterogeneous data for crisis management is not something that we have the opportunity to do very often! A lively lunch and coffee session enabled everyone to get together to get to know each other and to note down areas of overlapping research and work interest. We had a large collection of ideas on post it notes by the end of the day. Ideas for potential collaborations include building augmented reality apps, time series data analysis, human computer interaction for mobile and the use of data for crisis management. These are just a few of the 30+ ideas that came out of the workshop. 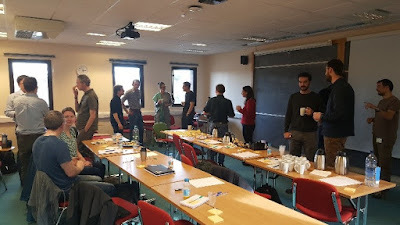 We would like to say a big thank you to the Heriot Watt Mathematical and Computer Sciences staff for hosting this event and we look forward to getting again together in the future for events such as a proposed hackathon. As for the collaborations that come out of this workshop, please watch this space!